This is one of the great Panchatantra stories for children. Once upon a time, there lived a flock of geese in a huge tamarind tree in the jungle. The geese had made the tree their home because of its constant supply of tamarind. Also, read A Wise Old Owl Story. One day, a wise old goose noticed a tiny, little creeper growing at the foot of the tamarind tree. “Let us get rid of that creeper,” he told the other geese. “Someday, it may be too big for us to destroy and we will regret it.” The other geese paid no attention to the wise old goose. They went about their usual business without a worry or care. Image Source@ www.justbooksreadaloud.com. The creeper grew little by little. Soon, the creeper had grown large enough and strong enough for a man to climb. The old goose warned them once again, “We must get rid of this creeper! If we do not, we will be sorry.” The other geese still did not listen to him. Then, one day, when they were out flying, a hunter came to the forest. He saw the tamarind tree and decided that it would be a good place to put his net. He went away deciding to come back the next day. And so, the hunter came the very next day and climbed up the tree with the help of the creeper. He set up his net on the tree and went away. When the birds came back to the tree, they flew right into it without noticing the net. Soon, they were trapped under it. The birds began to squawk loudly. They flapped their wings about in panic. Only the wise old goose sat still and very quiet. “How can you be so calm?” asked one of the other geese. “I tried to tell you that a day would come when we would regret not destroying the creeper. 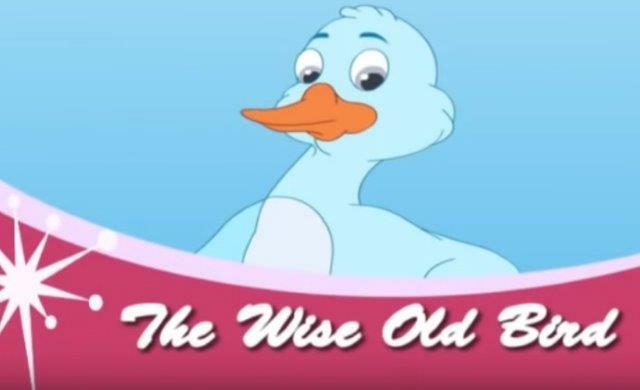 But no one listened,” said the wise old bird. When the hunter came, the birds lay perfectly still pretending to be dead. The hunter climbed the tree and threw them one by one. As soon as the last bird had been thrown to the ground, all of them took flight together. The hunter stood there, shocked at how he had been fooled by the geese. The geese were very grateful to the wise old goose. They had realized that they ought to solve their problems before the problem grows too big to be solved. You may also like to read, The Bird With Two Necks.